Busy, busy, busy. Are you crazy busy? Are all your friends busy? When you ask someone how they are, do they usually respond with how busy they are? I think we all are often busy, and some people are truly crazy busy while other’s busyness is self-imposed and becomes a trap, The Busy Trap, as the New York Times article called it a few months ago. I’ve been reading and hearing what many people are saying lately about how busy we all are and it got me thinking. How busy am I and how to I deal with being busy? I’m guilty myself of being crazy busy and sometimes creating my own busy. No matter what kind of busy you find yourself in, we all require some downtime, something which helps us destress, and maybe even slow down, even if for a little while. For me baking helps me battle my busy. I noticed very quickly when I was in graduate school that at certain points during each semester I would be compelled to bake from scratch. Not just a simple batch of chocolate chip cookies, but a recipe that was new and a little complicated. Over the years I’ve mastered a pumpkin caramel turtle cheesecake, my husband’s grandmother’s famous angel food cake recipe, sour cream coffee cake, butter blondies, brownies, cranberry pistachio cookies, and the list goes on. I have always loved to bake and I have been baking since I was a kid. Over the past few years however, baking has been more than just something that I like to do, baking is something I have needed to help me slow down my busy. Baking allows me to take my time and follow a recipe step by step. I like to bake by myself, often with my earbuds in and my favorite tunes turned up. I take my time to accurately measure, to pay attention to detail as I pour, mix, whisk, and frost. Baking is my outlet for my crazy busy. Baking battles my busy. 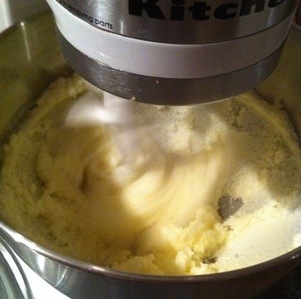 If you look closely you can see the heart shape in the dough as the mixer was turning. My busy has slowed down recently, and I no longer consider it crazy busy, just busy. Now I’m baking purely for fun (or last week for my first recipe review). 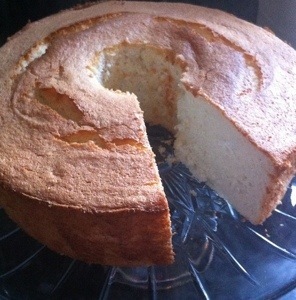 Yet, I still notice how baking helps me slow down my day, destress, and battle my busy. How do you battle your busy? Do you bake? Do you cook?